Have you ever been asked a question that has changed the course of your life? By then I had been editor of Cape Community Newspapers for nine years and sitting at a desk for up to 12 hours a day, eating badly while chasing deadlines, inadequate stress management, and not exercising enough, had caught up with me. I had become unfit, unhealthy and heavily overweight behind my desk. And that’s when I decided to apply to my lifestyle, the skills I knew best – I edited my eating. 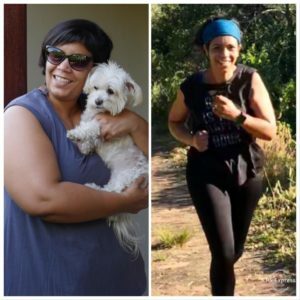 At that point I had already lost nearly 40kg and and was feeling ready for my next challenge when she suggested I do SSISA’s 12 weeks to 10km OptiFit programme. While I started with modest expectations, I did better than I thought I would, and toward end of the programme (and just before my 40th birthday) – Kathy sent me another message: “If I said Two Oceans, what would you say?”. Her message, of course, referred to the Old Mutual Two Oceans Marathon (OMTOM). And therein lies the point of this post. As part of SSISA’s 21.1km OptiFit programme, I’m training for my first half marathon on Saturday April 20. Kathy developed OptiFit in 1995 to create an environment in which members could exercise safely, under the guidance of professionals. It’s structured to be gradual and progressive and to reduce the risk of injury. But. Before we hit the road, we completed a medical screening and a fitness assessment. Look out for my before and after stats which I’ll post after the race. In addition to writing about my own experience, I’ll also be tackling topics such as hill and speed training, the importance of strength training for runners, rest and recovery, nutrition and the history of Africa’s biggest running event. While some runners have perfect biomechanics and somehow never seem to pick up injuries, most of us succumb since we have some muscle imbalances, leg length discrepancy or joint weakness. As part any exercise regimen, strength training should be included. Many people, and probably a large percentage of runners, prefer getting their heart rate up and being outdoors running rather than doing diligent strength training. Running, because of the stress it places on the body, will find one’s weaknesses which in everyday activities might go unnoticed. Not getting adequate rest and recovery can be a problem – but that is usually more common in more experienced runners. What does it take to run a half marathon?